Which degradation of the music caused by the play-back electronic is audible. Of course we were not the first, so we have to be better and we decided we want to be significant better in the performance than any other brand in the market. The TRINITY Reference Line was designed at a time where the measurement limits of the audio analyzers were in the range of -115dB. 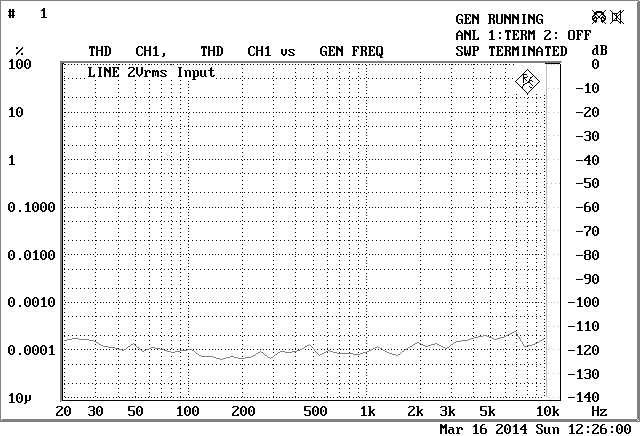 The next picture shows the excellent performance of the preamp of the Reference line. 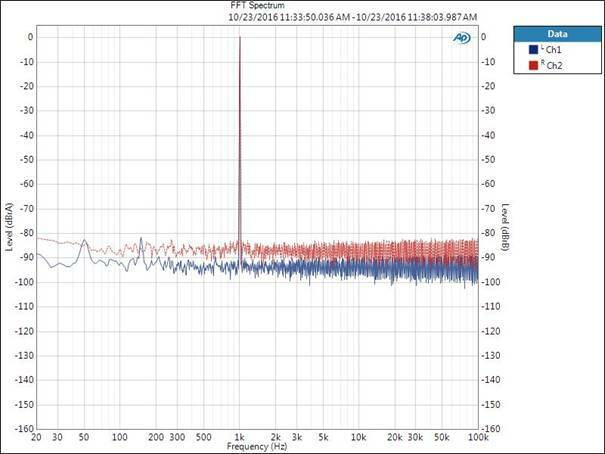 As you can see the measured distortion are in this range around -115…-120dB, that means we reached the technical limit of the available analyzer and we were not able to improve the performance, since all what we needed for a further improvement was better measurement equipment. These results are even today 4 years after the introduction of the Reference Line outstanding in the market. That is the reason why this Line is still in production, since there are no competitive products in the market. Nevertheless, in November 2014 Audio Precision lunched its new audio analyzer, which improved the measurement limit down to -140dB. Our company was the first here in Europe, which bought this analyzer. Now we were able to measure the real performance of the preamplifier of the Reference Line and we saw that the devices were significant better below 1kHz than we advertised. That was the trigger to design the Golden Reference Edition. The target was again to reach the measurement limits of this new analyzer. We started from scratch, since the topology of the Reference line was largely exhausted. The next picture shows the Total Harmonic Distortion Ratio of the New Gain Stage, which is used in the preamp and phono of the Golden Reference Line. The Gain is 6dB, the level is 6.3Vrms into 600Ohm, whereby the left channel (Ch1 red) shows the output signal of the preamp and the right channel (CH2 green) shows signal if a bare XLR cable is used and represent therefore the measurement limit of the currently available best audio analyser. The next picture shows the same Gain Stage used in the Phono Preamp of the Golden Reference Edition with a gain of 40dB and an input signal of 350µV. Again the left channel (Ch1 blue) shows the output signal of the preamp and the right channel shows signal if a bare XLR cable is used and represent therefore the measurement limit of the currently available best audio analyser. Here we can see that the preamp is even better than the cable, but this is of course impossible. The improvement comes from the fact that the noise level of the preamp is much better that the noise level of the analyser. Even at high gain we have reached the measurement limit again. The Oxymoron “Amplifying wire” is the Holy Grail for every engineer, since the wire itself is the most linear device, it has no distrotion, it has no noise, but unfortunately it has no gain since the output signal has always the same amplitude like the input signal. The dream is to add gain to a wire and you get the best linear amplifier. With this gain stage we found the Holy Grail since we have the designed the “amplifying wire”. I would assume that there will be no better analyzer available in the next decades, since we are now on the physical limit where the physical noise level is higher than the possible distortions in the audio signal generator. Game over. Nowadays ISO 226 is more common. 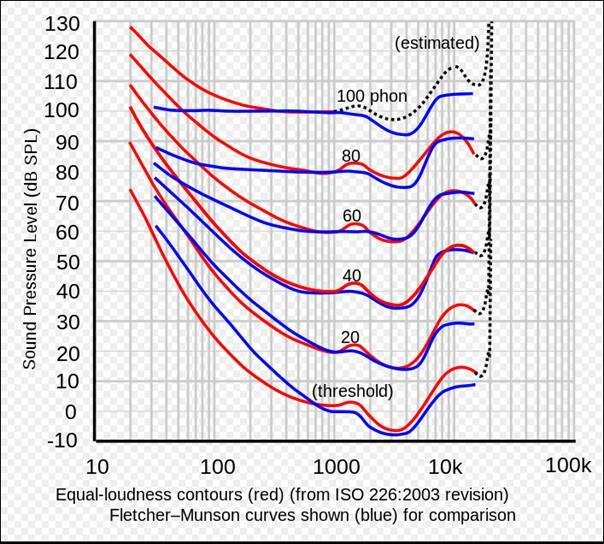 For our current considerations only the lowest curve is from interest, since it shows the hearing threshold over the frequency range. What does the graph shows us. The ear is most sensitive in the frequency range around 3kHz. The ear is constructed like a Helmholtz resonator with a tuning frequency around 3kHz, therefore we have the highest sensitivity around 3kHz. we can assume that the normal human have a hearing range of -110dB. The consequence is that the harmonic distortions of the play-back electronic must be below -110dB especially around 3kHz, otherwise the distortions are audible. On the other hand at lower and higher frequencies we would tolerate higher distortions. These tests are based on normal persons in an age range of 18 to 25 years. I would assume that people with a perfect pitch https://en.wikipedia.org/wiki/Absolute_pitch can listen even better. Power amp amplifies the distortions of the source, plus the distortions of the preamp and creates also some own distortions. We have therefore an error-propagation in the whole chain, where the distortions of all devices are summed up. For this reason we think the harmonic distortions of each electronic device should be well below these -110dB of the common hearing threshold. 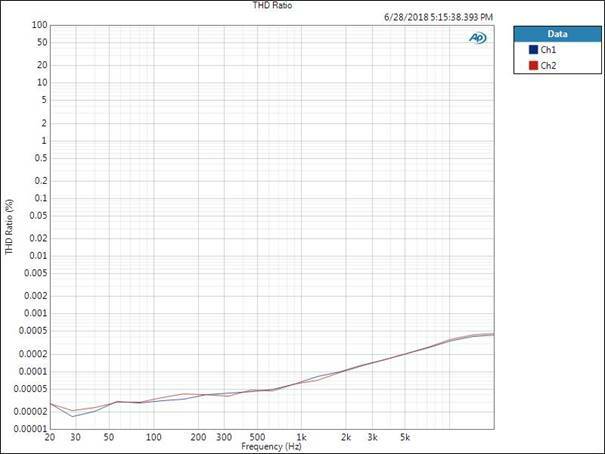 -120dB we can create a complete audio line with no audible distortions. These careful considerations were the basis for the development of the Golden Reference Edition and since we have no distortions at all in the devices of the Golden Reference Edition we are on the safe side for a real neutral play-back of music at home. The limitation lays now in the recording electronic, since even a 24bit recording has higher distortions. The theoretical dynamic range of a 24bit recording would be in a range of 144dB (24bit x 6dB), but the spurious free dynamic range of the best ADCs used in recording equipment is more in the range around 120dB. Just to mention a CD with its 16bits has “only” a dynamic range of 96dB, this means a CD cannot cover the complete dynamic range of our ear. Since the TRINITY Golden Reference Edition has no distortions at all we can say for sure, that this performance cannot be topped. Less than no distortion is impossible. These amplifiers are the most precise audio electronic in the high-end market for the next decades or even for ever.